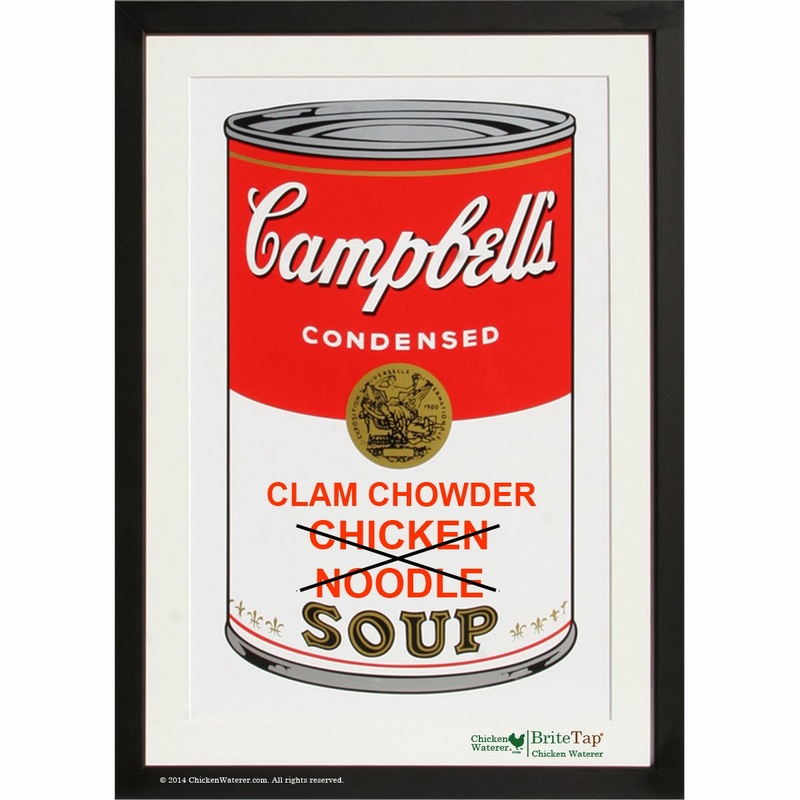 When chickens took over the management at Campbell's few realized the dramatic changes they would make to the product line. LOL. 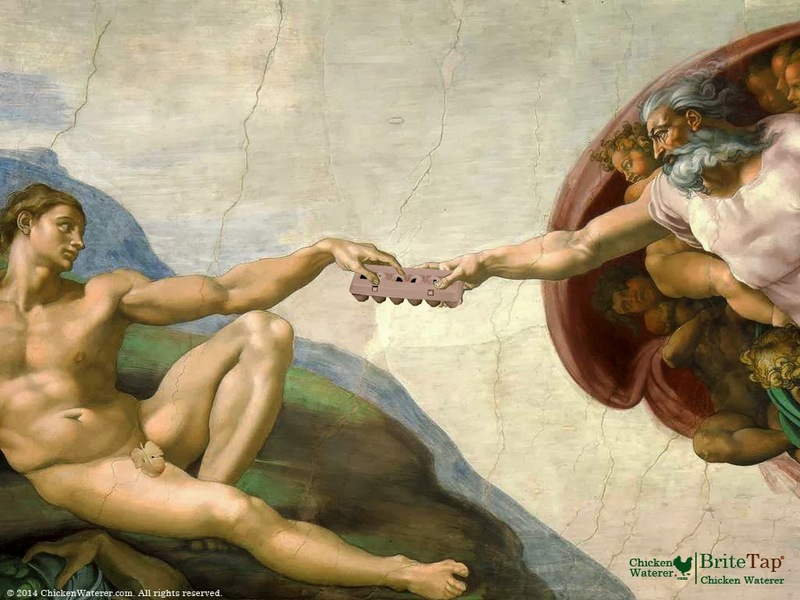 Ok tis is the last photo in our chicken art parody series. We hope you enjoyed these. Nothing makes you scream like a dirty chicken waterer. Nothing makes your day easier than a clean one. 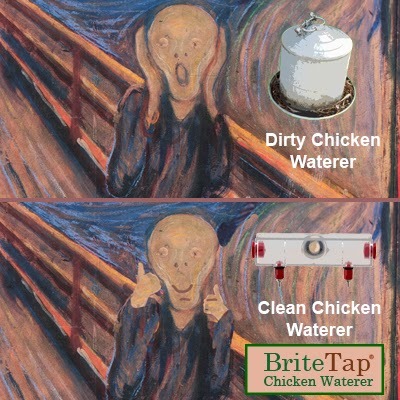 The BriteTap chicken waterer is clean water made simple. Check it out at ChickenWaterer.com. 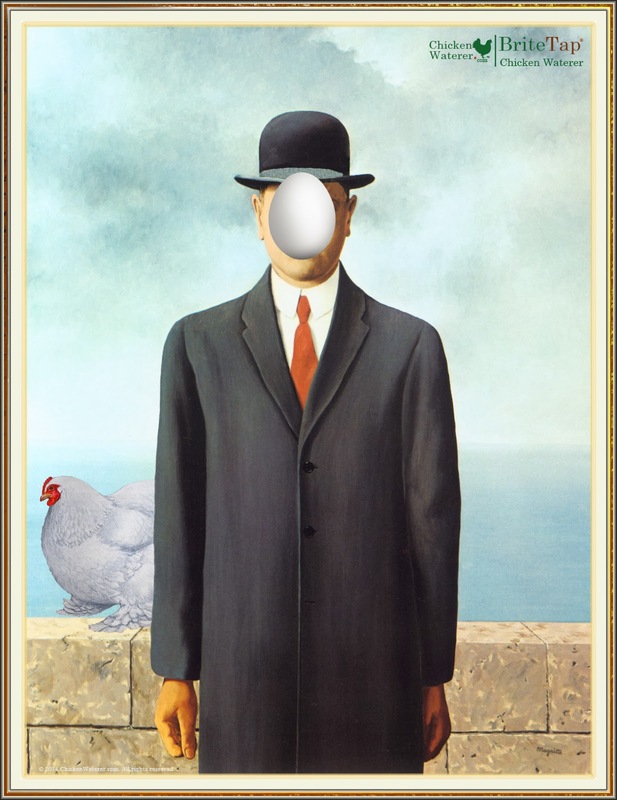 Rene Magritte's Son of Chicken was added to the collection in 1987. The work was donated by a benefactor who wishes to remain anonymous. This piece is conservatively estimated at $7.5 million in today's strong art market. It was the second piece to be added to the BriteTap Chicken Waterer Gallery and remains one of the most popular art works in the collection. Few art lovers realize that the many of the artworks that hang in museums today have been altered for public display. The original chicken artwork is owned by the ChickenWaterer Gallery in Palo Alto. In a rare public showing of these works, we will be posting photographs of the originals on our web site and facebook page over the course of the next few days. Admission is free to the public. Thanks to everyone sharing your reasons for loving chickens. Everyone did a great job and it was hard to make the final selections. Hen Curling made its debut at the Nagano games in 1998 and has since grown to be the most popular event in winter sports. 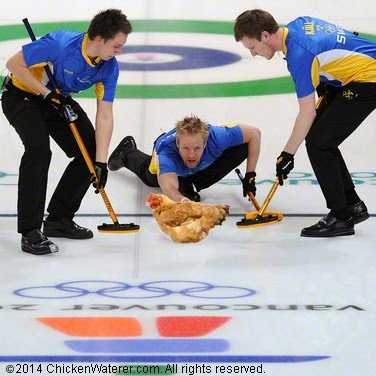 Eleven countries are fielding Hen Curling teams in Sochi this year and the competition has been brutal. "Sweden has a stranglehold on this game," says Red Star, President of the British Hen Curling Association, "There are only two rounds left, and Sweden is in the lead 8-3. I've always felt it was Sweden's game to lose." 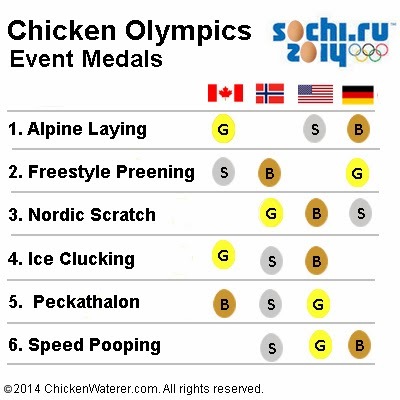 ChickenWaterer.com, maker of the BriteTap chicken waterer is a proud sponsor of the 2014 Chicken Olympics. U.S. Hen's have scored 5 medals but the field has become so competitive that no country has a clear lead in the race for Olympic gold. 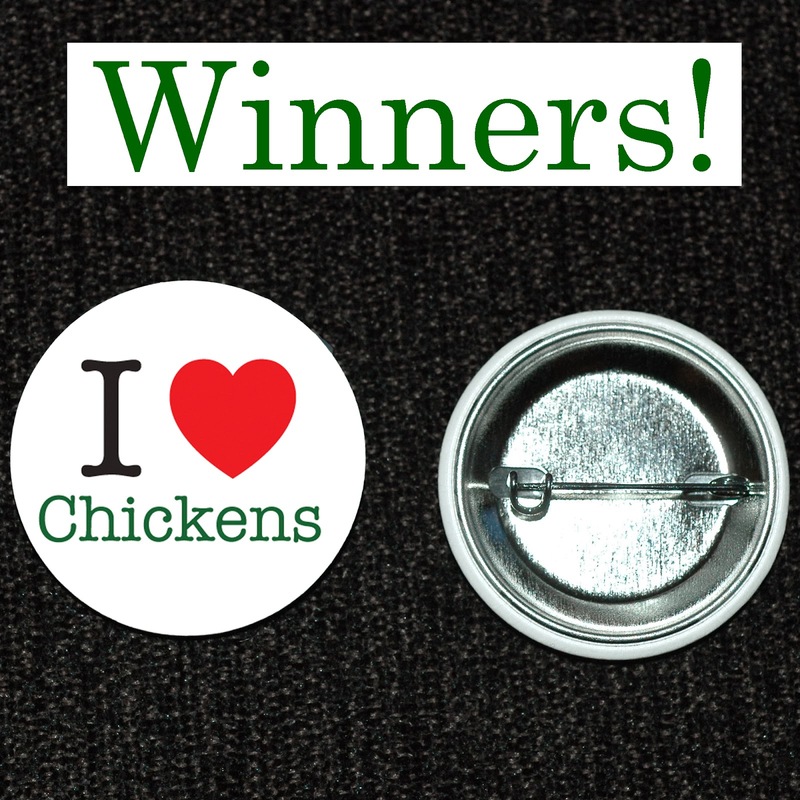 We're giving away "I Love Chickens" buttons to 10 creative Chicken Owners. Just post a comment here or on our Facebook page that explains why you love chickens. Winners will be based on creativity and will have their comments featured in our next e-newsletter, BriteSpot. Contest ends Sunday, Feb 16 2014, at midnight so enter today. By the way, if you would like to subscribe to our free monthly newsletter for chicken owners, here's the link to subscribe: BriteSpot Chickens Newsletter. Battery Cages or Cheaper Eggs? 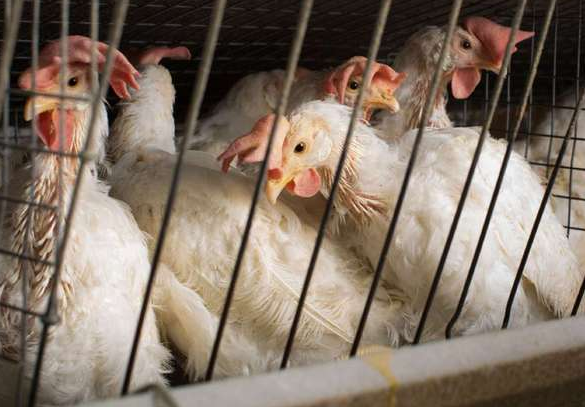 If you are following the debate in California regarding new laws governing caged chickens, there is an Op-Ed in today's LA Times which may be of interest. I recently came across a copy of an old magazine for poultry enthusiasts called The Poultry Keeper that was dated December, 1887. This journal for poultry enthusiasts was published in Parkesburg & Philadephia, Pennsylvania and was created for people who were “interested in making poultry pay," or so says the banner. Then as now, there was a good deal of interest in do-it-yourself projects. Perhaps, back then chicken owners really didn’t have much of a choice; you made it yourself or you did without. Let’s remember that in 1887 most men who fought in the civil war were still alive, over 40% of American’s lived on farms (versus 2% today), and the first Sears Roebuck catalog wouldn’t be published until the following year. If you didn’t build it yourself, you didn’t have it. Two small articles in the Poultry Keeper describing DIY projects caught my eye. I thought it would be fun to share these with you. They represent “high” tech poultry equipment design for the time. An incubator is a device that keeps fertilized eggs warm so that chicks can be hatched. Nowadays, a number of companies make very good electric units for home enthusiasts. These incubators include both a heating element and a thermostat. Plug them in, and they’re ready to go. 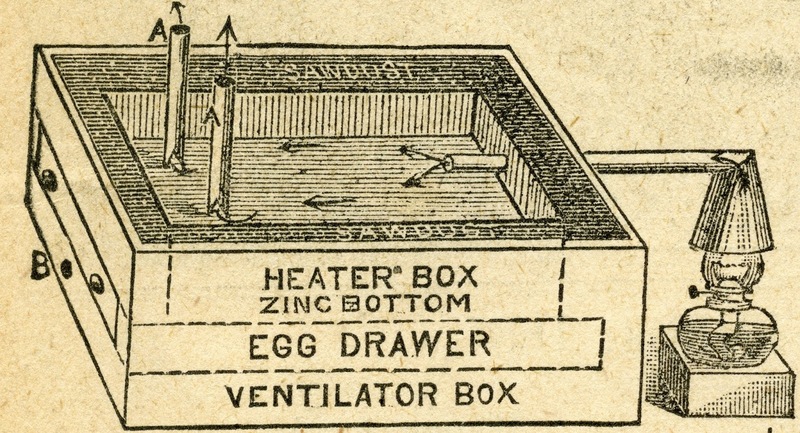 But in 1887, it wasn’t that easy…..
People had to build their own incubators and so The Poultry Keeper provided design ideas and simple instructions. One design used hot air to warm the incubator and a second design used hot water. That notwithstanding, both function in pretty much the same way. An oil lamp is used as a heat source and functions like a boiler. It heats either air or water, that is then allowed to circulate into a chamber within the incubator to provide heat. If you’ve ever lived in a house that was heated by a steam radiator, you’ll understand exactly how these systems work. The design shown below is the hot air system. A tin cone connected to a pipe is placed over the globe of an oil lamp. Heat generated by the oil lamp is transmitted to the air within the lamp and is allowed to circulate into the top of the incubator by way of the pipe. 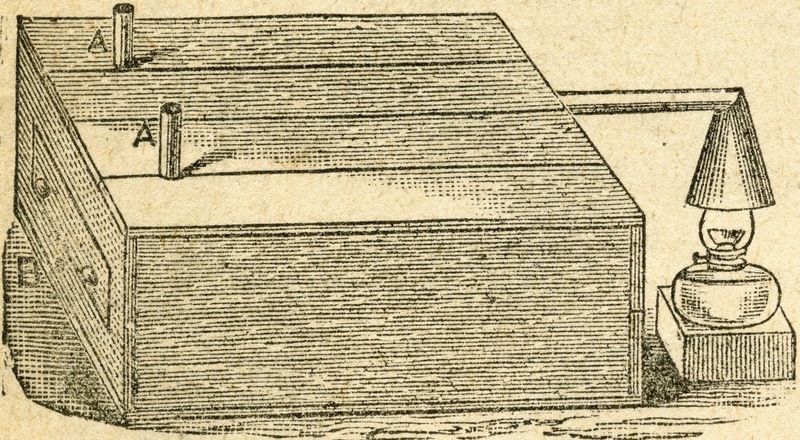 The second design is similar, but here a water chamber is constructed to fit over the globe. The lamp heats water in the chamber and this then circulates into a water tank within the incubator. The water is then recirculated -- Cooler water in the incubator is driven into the lover part of the lamp’s water chamber where it is re-heated and driven back into the incubator. In the same issue, a reader, Mr. G. A. Hayne of Dagerville, Iowa sent a drawing of a “regulator” that could be placed within the incubator to help control the temperature. However, unlike today’s thermostats, this device did not automatically adjust the temperature. Rather, it sounded an alarm that would let the chicken owner know that the brooder was either too hot or too cold. The owner would then need to manually adjust the wick within the lamp to either increase or decrease the heat. It is constructed of a thin sheet of metal riveted to a thin sheet of rubber. The rubber expands or contracts depending on the temperature in the environment. Therefore, it will either bend upward or downward. The extent of the bending depends on the temperature in the ambient environment. If it bends in either direction sufficiently (In other words the temperature is too hot or too cold) the metal end of the regulator will come in contact with one of two metal screws [I and J]. When this contact occurs, the circuit is closed and allows electricity to flow from the battery to the bell, sounding an alarm that calls the owner over to make an adjustment to the oil lamp. To make the system work, you only need to set the right distance between the two screws and the metal/rubber switch. This is done by setting the lower and upper temperatures using a thermometer. When the temperature is at the lower limit, you turn one of the screws till it just touches the metal sheet (causes a connection). Then turn up the heat and wait till the temperature reaches the upper limit of what you want and then turn the second screw till it just touches the metal sheet (causes another connection). The regulator is now set to ring whenever the temperature changes beyond the upper and lower temperature limits. Would this contraption work? I think so! 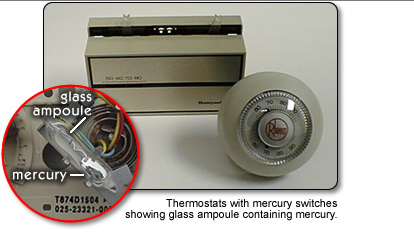 Modern thermostats operate along pretty much the same principle but instead of a metal sheet, the connection is made using a bubble of liquid mercury (like that used in an oral thermometer). When the temperature increases, the mercury expands and creates an electrical connection that turns on your heating unit. How accurate would it be? It really depends on the materials you use. However, in 1887 it would have been as high tech as it gets. 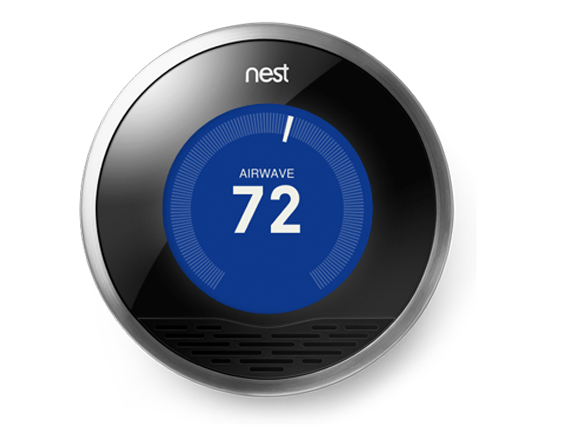 Nest Thermostat move over!